Maritime Vinyl: Revisiting some hair metal - Hericane Alice! Originally formed in 1984 as a trio, Hurricane Alice started out with Leni DiMancari on guitar and vocals, Scott Werner on bass and Rusty Miller on drums. They eventually recruited Bruce Nauman (formerly of The Employers) to be the lead singer. This lineup gained a considerable amount of success in their hometown of Minnesota, winning best band at the 1987 Minnesota Music Awards. This lineup changed when Bruce and Rusty decided to move to Los Angeles to pursue their music careers. Bruce and Rusty joined up with bassist Ian Mayo and guitarist Danny Gill and performed under the name Danger City (Ian and Danny’s former band). They soon agreed to change their name to Hurricane Alice to take advantage of their former fan base. Somewhere along the way Rusty Miller left the band as well (I read somewhere that it involved some legal troubles but I cannot confirm) and was replaced by drummer Jackie Ramos. It was this lineup that was signed to Atlantic Records and recorded their sole LP called Tear the House Down (they had previously only released an EP with the original lineup). 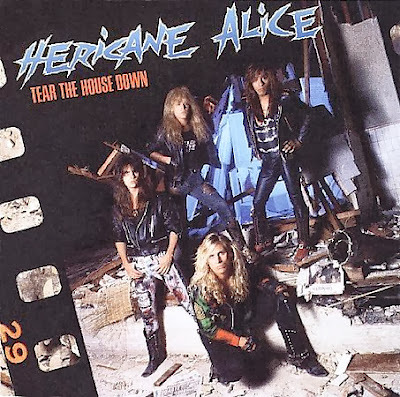 When they signed with Atlantic, they were forced to change the spelling of their name to Hericane Alice to avoid conflict with another metal band called Hurricane.